4 posts categorized "Samaha, Adam"
Since the Supreme Court's recent foray into Second Amendment jurisprudence in District of Columbia v Heller, there has been much brouhaha over the implications of that decision, both in academia and the popular media more broadly. In their latest paper, presented at last week's Crime and Punishment Workshop, Professors Philip Cook, Jens Ludwig, and Adam Samaha undertake the task of sorting through various legal arguments that have been made after Heller, and identify what they deem to be threats and sideshows from the social welfare perspective. Their conclusions will likely surprise most readers. First, the sideshows. The question that seems to have caught everyone's (or at least every lawyer's) attention since Heller is whether the Second Amendment is (or will be) incorporated (that is, applied to states and municipalities via the Fourteenth Amendment). If not, then Heller will be largely irrelevant, since most of the regulatory action occurs at the state and local level. But the real question is not whether incorporation will occur (it most likely will) but what will be incorporated, argue the professors. In other words, the scope of Second Amendment right as understood by courts—not the universality of its applicability to state and local governments—is likely to matter most when it comes to social welfare. Audio: Adam Samaha, "Muskets and Glocks: The Second Amendment Reborn?" Back in May, Assistant Professor of Law and Herbert and Marjorie Fried Teaching Scholar Adam Samaha addressed the Law School's annual Loop Luncheon. In his talk, Professor Samaha made some rather accurate predictions about the outcome of the U.S. Supreme Court's then-pending decision in District of Columbia v. Heller. He also addressed the issues that would be raised by the Court's decision and made some predictions about the next stages of the battle over the Second Amendment. You can listen to the full talk here. Conference: "Torture, Law, and War"
On February 29 and March 1, the Law School hosted an extraordinary conference devoted to the topic “Torture, Law, and War: What are the moral and legal boundaries on the use of coercion in interrogation?” The conference, which was sponsored by the Law and Philosophy Workshop with assistance from the Center for Comparative Constitutionalism, showcased the interdisciplinarity for which a Chicago legal education is renowned. Participants looked at the central question from the perspective of a wide range of fields, from law and public policy to psychology and history. Speakers included scholars from a dozen universities as well as the Law School's own Adam Samaha, Susan Bandes, Richard McAdams, Martha Nussbaum, Geoffrey Stone, Scott Anderson, and Eric Posner. 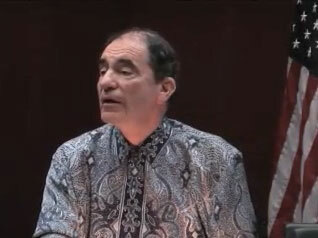 The conference keynote speaker was Justice Albie Sachs of the Constitutional Court of South Africa (pictured above). His talk, “Four tales of terrorism,” gave a first-hand account of his own torture by South African security forces and his brush with death when they attempted to assassinate him with a car bomb. It also described the principles behind the rejection of torture and capital punishment by the ANC, both before and after coming to power in South Africa. His talk discussed at some length four instances of terrorism, and the responses that courts and political leaders in South Africa made to them. Through these, he argued for the importance of adhering to the rule of law, including a refusal to resort to capital punishment, and also for the possibility of reconciliation with those who have previously used torture and terrorism against oneself and one’s own side in political struggles. Audio and video of the keynote address, along with the other panels of the conference, are now available on the conference web page. Each year, the Law School asks a faculty member to deliver a "First Monday" lecture in several cities in honor of the opening of the Supreme Court term. These lectures vary wildly in topic and scope, depending on what the speaker thinks the upcoming term will hold. Needless to say, the Supreme Court has been the subject of much discussion since the 2005 First Monday lecture, so Adam Samaha's talk called "Meet the New Boss" was both well-attended and well-received. We've had several alumni ask for a podcast of this talk, and we're delighted to bring it to you now. As always, podcast instructions are here.